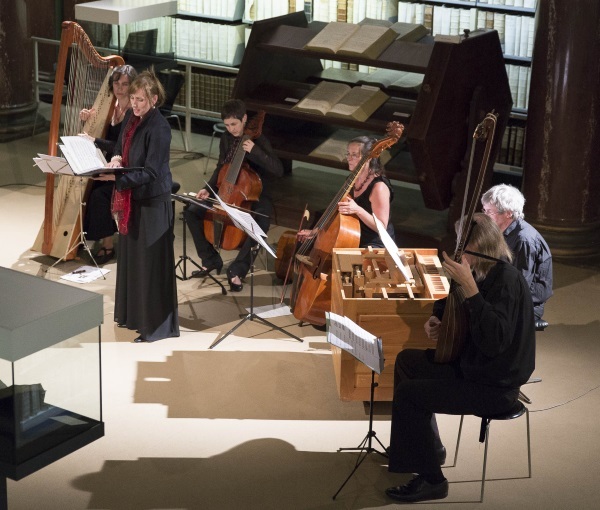 MUSIC FOR THE CONSORT, a public concert devised by Maria Skiba (Herzog August Bibliothek Wolfenbüttel and Hochschule für Musik, Theater and Medien, Hannover), was presented on June 11th as one of the results of the research undertaken by Maria Skiba for the Marrying Cultures project. 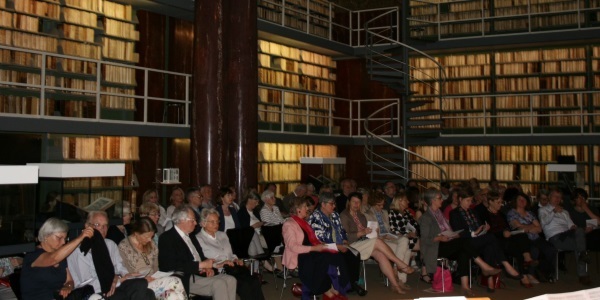 The event took place in the Augusteerhalle in Wolfenbüttel before a numerous and enthusiastic audience. 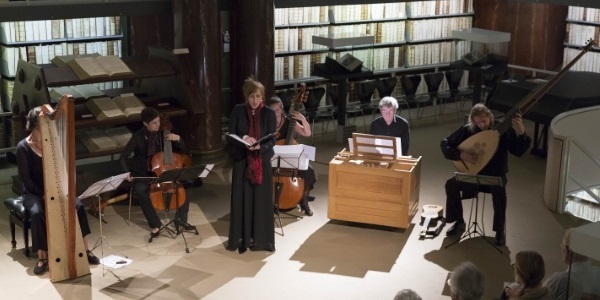 The ensembles involved were Bella Discordia and The Schoole of Night and they performed a variety of pieces connected or dedicated to various European consorts from the first half of the 17th century – from Christine de Lorraine, Maria Magdalena of Austria and Anna de’ Medici to the Empress Eleonora Gonzaga. Music was one of the means employed by courts to represent power and influence. In many cases the costs of musical spectacles were enormous but they were considered a good investment as part of a dynasty’s strategy for achieving and maintaining prestige. The performance of music by Giulio and Francesca Caccini, Barbara Strozzi, Claudio Monteverdi, Biagio Marini and Dietrich von dem Werder in our concert represented the cycle of a consort’s life that started with her wedding festivities and ended with the death of her husband. A princess who was to become a consort was usually well educated. She was most probably herself proficient in music and composition, maybe even playing several instruments – lute, guitar, viol or keyboards. Her marriage was designed to forge important alliances for her natal dynasty. The ideal consort embodied several virtues – she had to be pious, beautiful, utterly faithful to her husband, and she had to bear children and produce an heir. In case of her husband’s untimely death she was even expected to be able to assume the reins of power and act as a regent for her son, as in the case of both Christine de Lorraine and Maria Magdalena of Austria, who from 1621 acted as regents in Florence during the minority of Maria Magdalena’s son, Grand Duke Ferdinando de’ Medici. 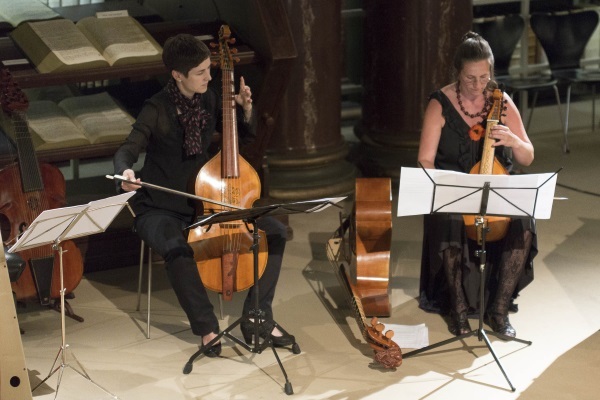 In the concert wedding cantatas were intertwined with religious chamber pieces showing a consort’s piety and accompanied by instrumental pieces from the court in Brussels (Giovanni Paolo Foscarini) and from Marco Schacchi’s Cribrum musicum (1643) for the royal court of Warsaw. The performance ended with songs of mourning and consolation. From Intermedii e concerti della pellegrina, Florence 1689 for the wedding of Christine de Lorraine (1565-1637) and Ferdinando I de’ Medici (1549-1609). Performed on 2 May 1598 in the Ufizzi theatre following a series of events for the wedding celebrations, the set of musical scenes was one of the most expensive and most elaborate music theatre productions to be staged in Florence. The composers involved in creating this spectacle included Cristofano Malvezzi, Luca Marenzio, Giulio Caccini, Antonio Archilei, Jacopo Peri and Giovanni de’ Bardi. It was a set of 6 intermedii. The staging was very elaborate with machines, marvellous sets and some of the most famous musicians of the time, such as the singer Vittoria Archilei, were engaged as performers. The aria performed here was from the Fourth Intermedio. According to the sources, this was the most horrifying of all. It opens with Io che da ciel cader sung by a sorceress who invokes all the fire demons. It was sung by Caccini’s first wife, Lucia. Ca. 1626. This Vilnius organ tablature illustrated with images from the life of St. Francis contains keyboard music used by the Catholic communities in Lithuania in the first half of the 17th century. It was probably commissioned by the Bernardine brothers, who had the best organ in Lithuania built for their church in Vilnius. Similar to the Jesuits, the Bernardines cultivated music as part of their Counter-Reformation activities. They maintained close relations with the court in Warsaw, where music was also seen as part of a wider political strategy. Most pieces are anonymous, but four ricercars have been identified as pieces by Girolamo Frescobaldi (from the collection Recercari et canzoni francese, Rome 1615) and one composition in the book is signed by F.L., which may suggest that it is by the Warsaw court composer Francesco Gigli (Franciszek Lilius). From Cantate, ariette e duetti, Venice 1651, dedicated to Emperor Ferdinand III (1608-1657) by Barbara Strozzi (1619-1677). The opening piece of this collection is a cantata for the wedding of Ferdinand III and his third wife Eleonora Gonzaga of Mantua (1630-1686). The book contains yet another wedding cantata – this one for the 1648 wedding of Ferdinand III and his second wife Archduchess Maria Leopoldina of Austria (1632-1649). Archduchess Maria Leopoldina was the daughter of Leopold V and Claudia de’ Medici. When she married Ferdinand and became the Empress consort of the Holy Roman Empire she was merely 16 years old. At 17, she died in childbirth. Foscarini was employed at the court of the Archdukes Albrecht and Isabella in Brussels. He was a pioneer in playing the new instrument, the guitarra spagnuola. The guitar became extremely popular among noble women. Francesca Caccini was a daughter of Giulio Caccini. She enjoyed an international reputation as a virtuosa and a national one as a teacher and director of chamber singing. In 1607, she officially entered the service of the Grand Duke of Tuscany as a musica of the female court of Christine de Lorraine and later Maria Magdalena of Austria in Florence. Her duties included singing, playing instruments, teaching singing, coaching and directing chamber music. The book she published in 1618 is the longest and one of the most varied collections of solo songs to be produced in her generation. It is evidence of her practice as a performer, but because it includes examples of every genre a solo singer needed to master, Francesca’s book has also been seen to reflect her pedagogical ambitions and her success as a teacher. The pieces were probably meant to be performed during private services in the chambers of the Grand Duchess. Selva morale e spirituale (1640) by Claudio Monteverdi (1567-1643) is dedicated to Empress Eleonora Gonzaga (1598-1655), consort of the Holy Roman Emperor Ferdinand II. Eleonora came from Mantua, a centre of art and music where Claudio Monteverdi was employed as maestro di capella. In 1608, his Favola Arianna was performed with its famous recitative Lamento d’Arianna. In 1640, Claudio Monteverdi dedicated his book of religious pieces to Eleonora Gonzaga, and this large collection of vocal and instrumental compositions also contains Pianto della Madonna, which is a Latin contrafactum of the famous Lamento d’Arianna. Eleonora was known for her devout Marian piety. In 1637, she instituted Marian Lenten celebrations of the Fifteen Mysteries in the Augustine Church, a service unique to Vienna, where in the 1640s dramatic music was used in church services. It is therefore not unlikely that Pianto was performed during some of these services. Salve Regina byBarbara Strozzi(1619-1677). In 1655, Strozzi dedicated her Sacri musicali afetti to Anna de’ Medici (Grand Duchess in Innsbruck), who in return rewarded her with great gifts. It is still not entirely clear whether Anna de’ Medici actually commissioned this collection of music or whether she financed its publication. What is interesting is that this collection of sacred motets also contains Salve Regina set to music – an antiphon that for the Jesuits was the quintessence of Catholicism and earlier inspired fiery criticism from Martin Luther and the reformers. In both Innsbruck and in Hall (Tirol) the Jesuits maintained colleges from which they spread the cult of the Virgin Mary, both through their use of the Salve Regina and of images of Mariahilf. Marian piety was central for the self-fashioning of many Catholic princesses, especially in the Holy Roman Empire and Poland-Lithuania, where the Virgin Mary was the official patroness of the state. The sacred music collections dedicated to princesses very often include settings of the Salve Regina. It is thus very probable that all the Marian pieces in the Sacri musicali afetti can be seen as an affirmation of the Counter Reformation. Cribrum musicum ad triticum siferticum, by Marco Schacchi (c. 1600-1662), published in Venice in 1643, is a treatise in which he accuses Paul Siefert (1586-1666) – a musician from Danzig – of inadequate musical skills. The war of words which this publication started lasted for years. This book contains a part called Xenia Apollinea with 50 pieces by the members of the Royal Chapel in Warsaw as a demonstration of good compositional practice. In our concert the collection provided an illustration of what the foreign consorts of the Polish Vasa kings as well as the only princess at court (Anna Catharina Constantia) were used to hear in the chambers of the castle in Warsaw or in Vilnius in the first half of the 17th century. Vier und zwanzig Freuden-reiche Trost-Lieder/oder Trost-reiche Freuden-Gesänge, Leipzig 1653 by Dietrich von dem Werder (1584-1657) is dedicated to Elisabeth Charlotte von Brandenburg (1597-1660), widow of Georg Wilhelm (1597-1640), Elector of Brandenburg. The compositions, designed for one instrument and one voice, come from a tradition of consolation music where music is regarded as therapeutic medicine. In this case, Werder’s songs, obviously designed to be sung in a small circle, attempt to console mothers for the loss of children or widows in their solitude. A song about Isabella of Austria, Queen of Denmark (1501-1526), also known also as Elizabeth of Austria. A daughter of Philip I of Spain and Joanna of Castile, she spent her childhood in the Netherlands under the tutelage of the regent of the Netherlands, Margaret of Austria. In 1514, at the age of 13, she was married to Christian II of Denmark and became queen consort of Denmark and Norway. In 1523, Christian was deposed and had to leave Denmark. Isabelle travelled with him to the Netherlands, where she died in early 1526 at the age of 24. The a capella performance of the Queen’s lament, was the high point and the finale of the concert.